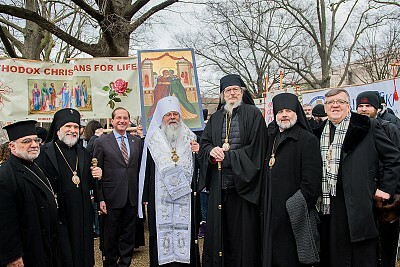 His Beatitude Metropolitan Tikhon, together with other OCA hierarchs, clergy, seminarians and faithful, participated in the annual March for Life in Washington, DC on Friday, January 18. The march is a pro-life rally protesting abortion, held in the nation's capital near the anniversary of the infamous decision in the United States Supreme Court case Roe v. Wade. Joining the OCA Bishops for the prayer service for the unborn were His Grace the Right Reverend Thomas of the Antiochian Archdiocese and Alexander Azar, Secretary of Health and Human Services.